Submit original, credible information online or by mail/fax. Submissions can be anonymous with attorney representation. By law, SEC protects the identity of all whistleblowers. 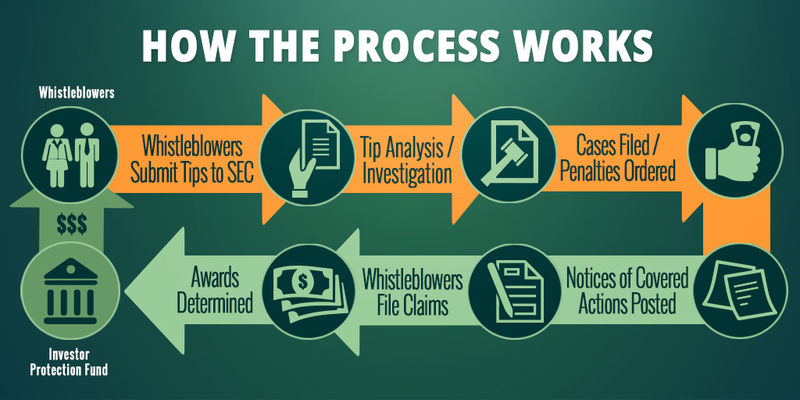 Among thousands of tips received annually, every submission is thoroughly evaluated by SEC enforcement staff for high-quality information that warrants deeper investigation. SEC enforcement staff determine laws have been broken. Enforcement action is filed publicly against the wrongdoer. Penalties ordered upon settlement or completion of successful litigation. Payments come from a special fund established by Congress with sanctions collected from securities law violators. No money is withheld from harmed investors to pay awards. Commission weighs various factors about a whistleblower’s contribution and assistance. Awards range from 10 to 30 percent of money collected in a case. Individuals have 90 days after notice is posted to apply for an award by completing and submitting a simple form. The SEC website alerts the public about cases in which sanctions exceed $1 million so everyone has the opportunity to apply for an award.